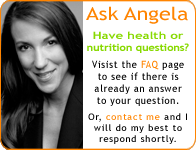 Are you tired of being overwhelmed with complicated and often conflicting messages from the diet and health industry? This blog is about learning to let go of gimmicky eating and discovering how easy making healthy food choices can be! I'm a certified nutritionist, blogger, writer, and mom. My passion is teaching people how to live a healthy diet-free life. Most of us don't grow up with an education in nutrition. The food companies and the diet industry take advantage of this fact by marketing foods and products as healthy, when they're not. Eating healthy shouldn't and isn't a complicated process. I want to help people make sense of this information by transforming these conflicting messages into a simple straight forward plan of action towards better health. To cook the quinoa, combine the quinoa, water and salt. Bring to a boil and turn down the heat to low cook for 15-20 minutes. When it is ready, small steam holes should appear on the surface. Remove from the heat; transfer the quinoa into a large bowl to cool down. While the quinoa is cooking, prepare the rest of the ingredients; peel and diced the cucumber (remove the seeds if desired), core and diced the tomatoes and onions. Add the diced cucumbers, tomatoes, red onions and black beans to the cooled quinoa. Remove the basil leaves from the stem and roughly chop, then add to the mixture. Cut and juice the lime over the salad. Start with one lime before adding the second one, to taste. Drizzle with olive oil, then season with salt to taste. Transfer to a large platter or spoon onto individual plates. Crumble the feta cheese on top of the salad and serve.